Lobuje peak climbing demands mountaineering in a professional and committed manner.Lobuche East peak 6119m is one of the popular trekking peaks in Nepal .There are various routes for climbing Lobuje east . The normal route for climbing is through south ridge. Lobuche east peak consists of several small summits and the true summit requires climbing steep snow and ice slopes to the top from the summit ridge. The approach trek to Lobuje east climbing follows the classic Everest base camp route up to Pheriche and then it heads to Dughla .The base camp is set up near a lake below the south face at an altitude of 4950m. The views of Amadablam, Cholaste, Thamserku, Kantega peak and Tawache peak are superb from the base camp.. You climb steep stone terraces and snow slopes just below the main glaciers on the south-west face of Lobuche east. You climb steep snow and ice slopes using fix ropes and get access to the ridge overlooking Lobuche and the Khumbu Glacier where we fix the high camp. You follow the sharp snow ridge to the summit ridge. Then we follow the route to north-west towards the main summit passing several small snow bumps and reach a notch. Then we further climb steep and quite difficult snow slopes to the true summit. The peak can be climbed from east face by climbing a dark pyramid of scabby rock and join the South Ridge to get to the summit. Day 01 : Arrival to Kathmandu airport and transfer to hotel. Day 02 : A free day in Kathmandu. Day 03 : Fly to Lukla and trek to Phakding. Day 04 : Trek to Namche Bazar. Day 05 : Rest day in Namche Bazar. Day 07 : Trek to Dingboche. Day 08 : Trek to Chhukung. Day 09 : Camp at Lobuche. 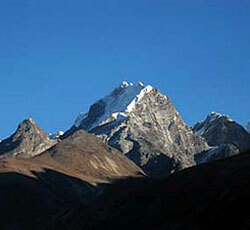 Day 10 : Climbing Lobuche Peak and return to Base camp. Day 11 : Climbing if incase for bad weather. Day 12 : Trek to Gorakshep. Day 13 : Gorakshep climb up to Kalapatthar Base camp. Day 14 : Gorakshep back to Pheriche. Day 15 : Trek to Thyangboche. Day 16 : Trek to Khumjung. Day 17 : Trek to Phakding. Day 18 : Trek to Lukla. Day 19 : Fly back to Kathmandu and transfer to hotel. Day 20 : A free day in Kathmandu. Food and accomodation in tea house lodges for the clients in tea house lodges. Accomodation on tented camp during climbing, food cooked by our camp cook.